"Your reliable source for quality brass." That’s our motto here at Roberts and Son Brass (R&SB). We want our customers to have confidence in the brass that we sell, and we believe there are three primary factors that will dictate the quality of brass that someone receives when buying from a brass company such as ourselves; 1) the initial source that the company received the brass from, 2) the methods by which that company processes the brass, and 3) the methods by which the brass is preserved and protected, and ultimately shipped to you, the customer. Allow us to go into further detail and explain why each of these factors is important to you as an end user or reloader of the brass. Many brass resellers make the claim that they’re offering “once-fired” brass, when in fact this may not be the case. The term once-fired signifies that the brass has been fired only once in the entirety of its lifetime, and no more. When this term is used by companies who are selling range pickup brass, or brass that is sourced anywhere other than straight from the military, it should go under great scrutiny by you as the end user of the brass. 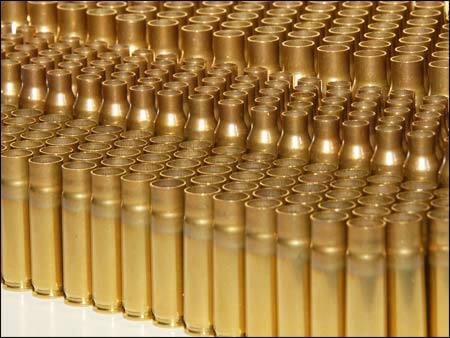 The danger with range pickup brass is that no one knows how many times it’s been reloaded. It may have been fired just the first time. It may have been reloaded and fired a second or third time. Or, it may have been reloaded and fired ten times and is at the very end of its life cycle. Without knowing the facts, it’s extremely hard to tell what type and quality of brass you’re dealing with. This is why R&SB sources brass from strictly one source – straight from the United States military. This brass is guaranteed to have only been fired once, so we can assuredly say to you that our brass is, in fact, “once-fired” and “once-fired” only. In addition, the quality and consistency of LC, WCC, and other common military brass suppliers is on par with the very best brass suppliers around. This brass is known to have some of the thickest web sections of any brass available, and can make for excellent match reloads. Step 1) Debris is sifted from the brass. No one wants to get a pile of rocks, sticks, or grass when they buy a batch of unprocessed, once-fired brass. Although we can’t guarantee that all debris is removed from the brass without sending it through our full wash cycle, this initial step removes approximately 95% of debris that the reloader would otherwise have to deal with when buying unprocessed cases. Step 2) The brass is deprimed. The depriming operation is relatively self explanatory; we remove the primer from the case. To ensure that we achieve a positive depriming of each case, we utilize technology that allows us to sense whether or not the primer actually fell from the case. Step 3) The military crimp is removed. To remove the military crimp, we utilize a hardened swage rod that swages the crimp out of the primer pocket. We’ve found the swaging method is superior to the alternative method of reaming the primer pockets, due to the fact that swaging removes very little, if any, material from the primer pocket. This aids in the prevention of loose primer pockets down the road when reloading the same brass multiple times, or when using reloads that are towards the upper end of the acceptable pressure range for a given case. Step 4) The brass is washed and polished. We wait until the brass is deprimed to perform this important step. This ensures that the primer pockets and flash holes get cleaned, along with the rest of the case. At R&SB, we’ve spent countless hours in research trying to discover the most effective way to clean brass to leave it with a bright, vivid finish. Our multi-step method that we’ve developed not only cleans and polishes the exterior of each case to a smooth, brilliant finish, but also cleans and polishes the interior of each case, including the primer pockets and flash holes where stubborn deposits build up and can be hard to remove. Step 5) The brass is annealed. Our annealing operation ensures that the brass you receive is stress-free. Two main benefits of annealed cases are that sizing operations are much more consistent, and that neck tension is more uniform from case to case (which yields consistent bullet release). In addition, with a caliber such as the 300 Blackout, which undergoes a serious multi-step sizing operation, annealing is a must in order to restore the brass to its original state. If 300 BLK brass is not annealed, it’s left in a work-hardened state that can quickly lead to split necks and other potential problems. Make sure and check for this step elsewhere – we believe you’ll find that very few companies even offer this service. With R&SB, this is the standard. Step 6) The cases receive a thin layer of lubrication. Our case lube is a proprietary lubricant that helps us achieve consistent sizing with each and every case. We apply it in a very thin layer to ensure you don’t receive cases with the infamous “sizing dent”. Although we wash off all case lube later in our process, it’s worth noting that our case lube is harmless to gun powder and primers, unlike many other sizing lubricants available on the market today. Step 7) The brass is sized. We achieve consistent sizing by utilizing automated equipment that applies force at a continuous, steady rate to the brass. We systematically batch-check our cases with sizing gauges and chamber gauges to verify that the cases are being sized to the proper specification. Step 8) The brass is trimmed to length. We trim our brass with a high speed cutter that utilizes a slight outward chamfer. This leaves each case with a smooth, clean cut. Step 9) The case mouths are slightly belled. By belling the case mouth, we eliminate the need for the reloader to manually chamfer the inside of each case mouth. Our bell is minimal; in fact, most people wouldn't be able to see it or notice it unless we told them. However, it’s enough that it allows the reloader to place a flat-based bullet on the case mouth without it falling over, and then seat the bullet without shearing any copper from the bullet’s jacket. This is a preferred method as opposed to chamfering, because it’s more consistent, and it also doesn’t require removal of brass from the mouth of the case. Step 10) The brass undergoes a rinse. Even though we apply a strong vacuum force during our trimming operation, small pieces of brass can still fall into the cases. Our final rinse not only removes the sizing lubricant from the cases, but also helps get rid of those pesky brass trimmings. Please note that the process outlined above is for our "Fully Processed" brass. We also sell brass that’s at less complete stages of the process, if the reloader wishes to perform some of the processing operations on their own. Once all the hard work is done, we don’t call it quits. We want our brass to arrive at your doorstep in the very same condition that it leaves our processing facility. That’s why we place our brass in heavy duty 4 MIL bags, seal them up with a desiccant to mitigate any moisture (with the exception of unprocessed cases), and then place it all inside a heavy duty wood crate. The custom wood crate is to ensure the brass will be protected from anything it may encounter between our doorstep and yours. This means you can finally say goodbye to mushy boxes and dented case mouths, because we preserve your brass the same way we process it – with pride. Copyright Roberts and Son Brass Inc.. All Rights Reserved. NOTE: Roberts and Son Brass Inc. does not sell any loaded ammunition.